The river holds a lot of history. Some of it has flowed downstream with the currents and moved on to the sea but some of its oldest history is still here. 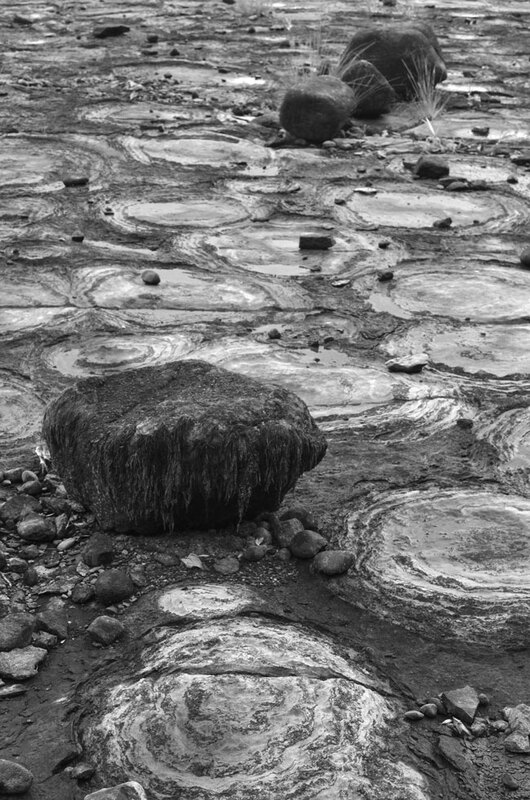 And when the water is low you can find one of the most striking features visible along the Ottawa River shoreline: The stromatolites on the Quebec side of the river. 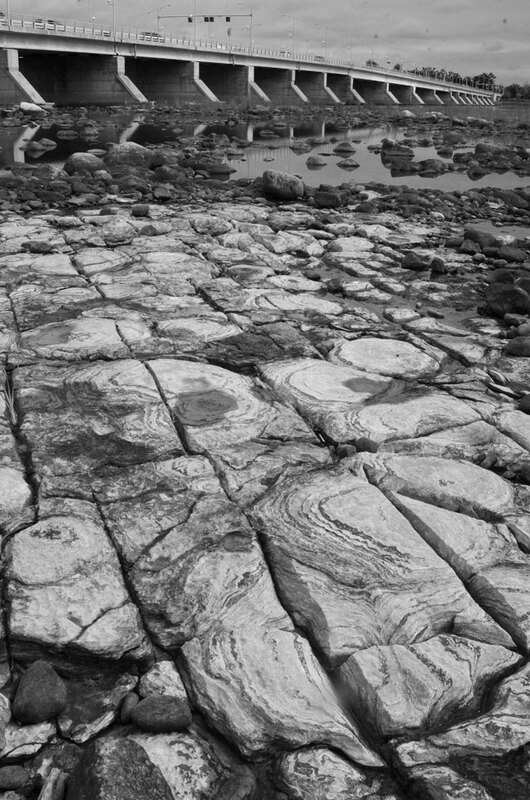 They have been scraped down by glaciers and eroded by time but the ancient stromatolite bed remnants are still remarkably beautiful and visible. 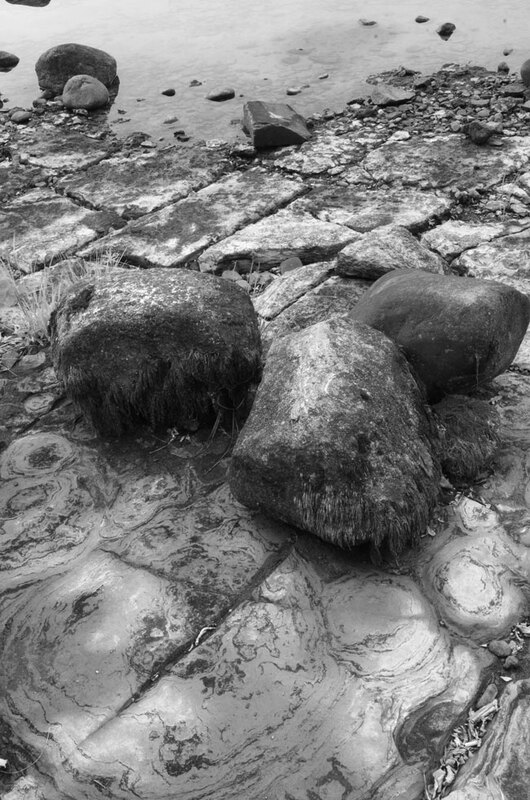 The seaweed growth on the rock above shows that the stromatolite formations are often covered by water. 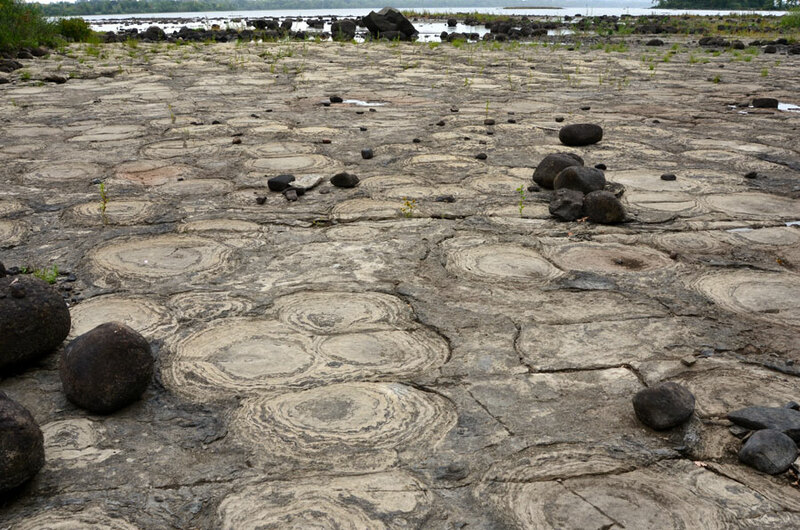 These stromatolites are over 450 million years old and were formed during the Paleozoic period when this area was located near the equator and was covered in a warm shallow sea. The stromatolites are built up in layers by cyanobacteria, also known as blue-green algae, and are accretionary structures rather than body fossils. This cross-section above, of a dislodged and abraded stromatolite shows the many thin biofilm layers that are built up by cyanobacteria (blue-green algae). 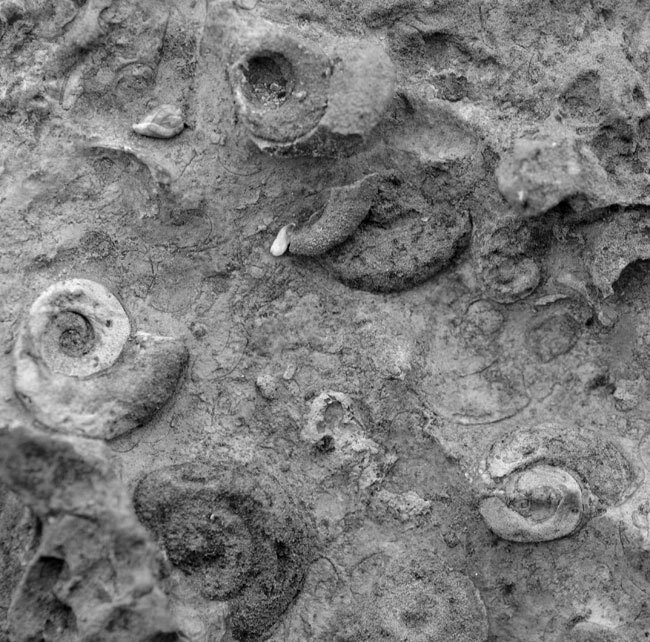 Nearby fossil-rich rocks – which are slowly being eroded by the current – exposing various fossil snails. The Champlain Bridge linking Ontario and Quebec; a striking contrast between the modern and the ancient world. They are cool, aren’t they? I’m glad you find it interesting. Helen, I added a colour image for reference but what I like about the black and white is how it emphasizes form. It’s hard to imagine 450 million years, isn’t it? I’m fascinated by them also. Thank you, Yoshizen. I want to use the word fascinating, although previous commenters already have. Yes, that’s the word. I’ve never seen anything like this before. They are remarkable remnants and I agree; fascinating. Thanks for your comment, Elena. Amazing! 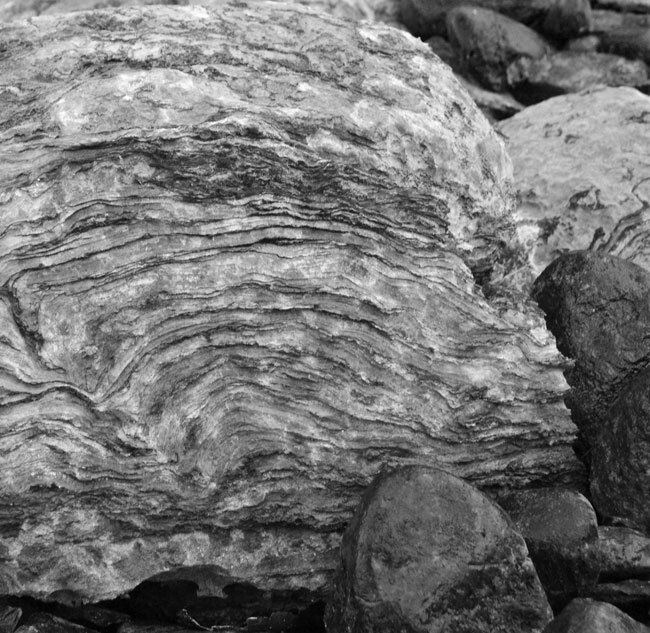 I’d never heard the word stromatolite before! The textures and juxtaposition of pattern really engage the viewer. I suppose it’s not a common word and these are unusual formations. I’m glad you found it interesting. Thank you! Nature is full of interesting patterns. Thank you, Mimo. I neither knew about nor saw these formations before. I’m glad you introduced it. I’m glad you find this interesting, thank you! You really capture the essence of place with your photos. The world’s oldest life form, extraordinary antiquity. 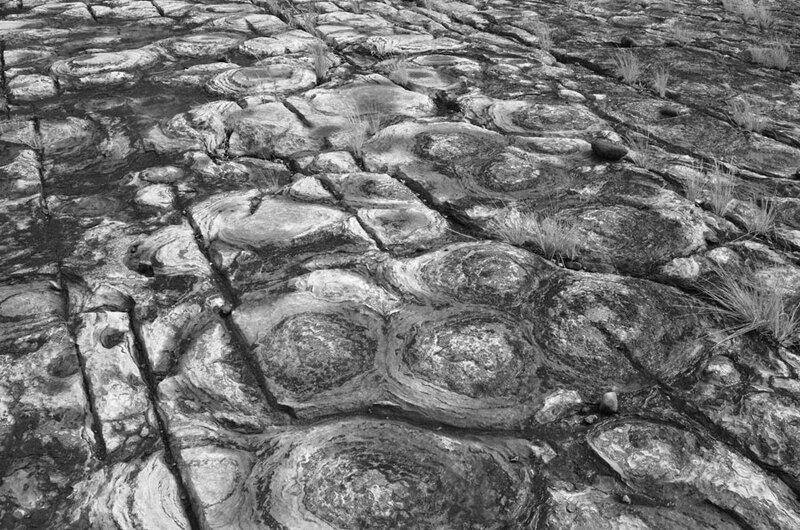 Amazing too that the stromatolites in Western Australia are not only preserved but still growing. I guess I should have mentioned that in my post. I would love to see the ones in Australia! 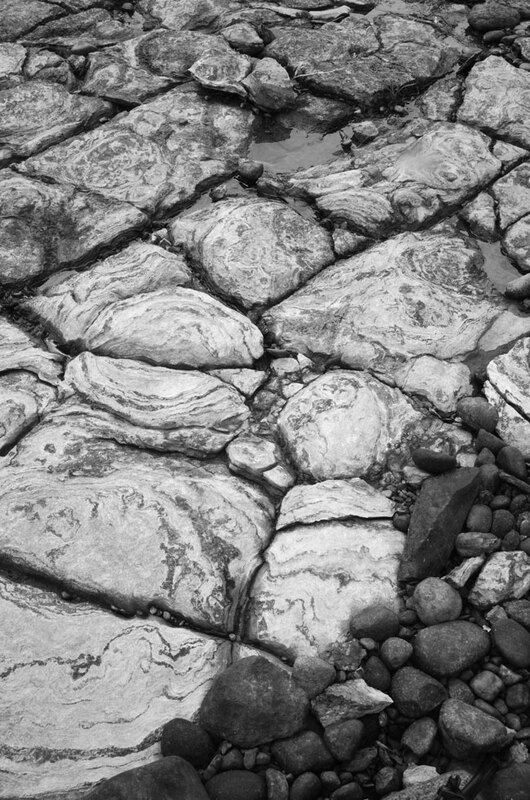 Fantastic patterns and textures – another thought provoking post ! Many thanks for sharing another very interesting aspect of your coastline with us ! Hi Chris, thanks for the great comment! My pleasure Karen to give you something in return for your wonderful pictures! I’m particularly taken by the lines, patterns, textures and shapes, quite apart from their uniqueness. 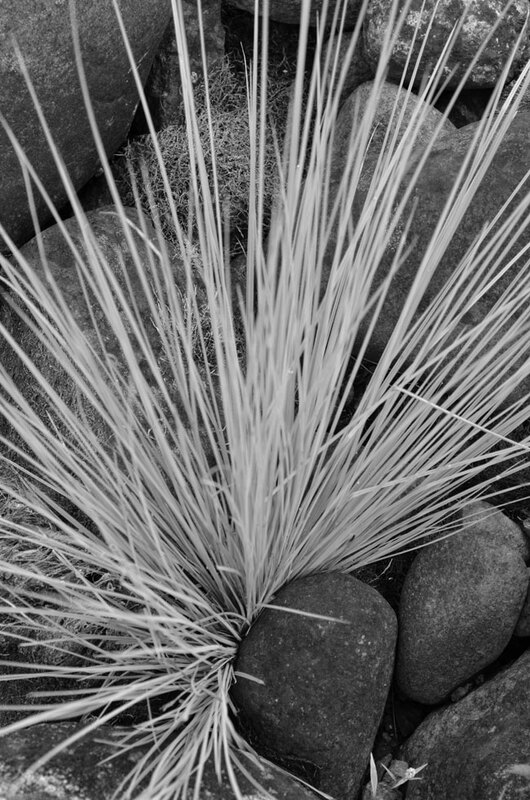 My preference is for the b&w – they emphasize and focus attention on these characteristics. Thank, Louis. I agree about the black and white emphasizing form. I think we share a similar aesthetic preference. Anita, they are cool, aren’t they? They are certainly under the radar in Ottawa for such a significant set of fossils. Great shots, Karen – really interesting post. I’m happy you found it interesting, Richard. 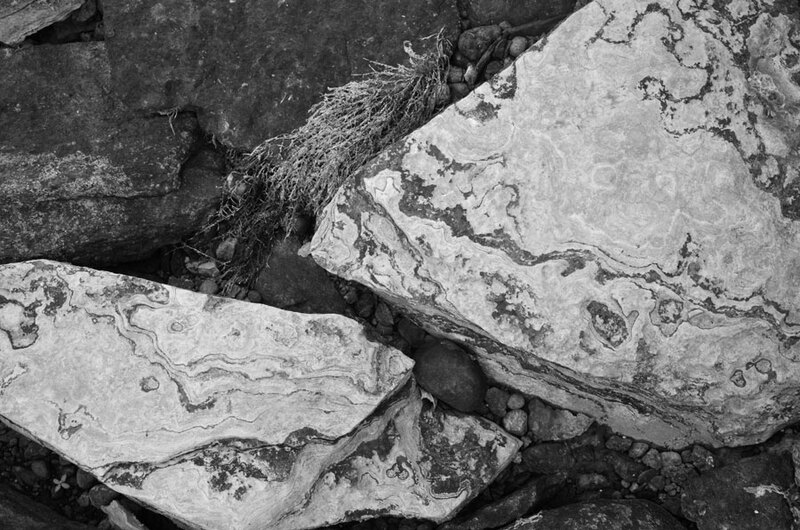 These make such nice patterns, and work so well in black and white. I like this idea of mapping with a camera. This is true, Alessandro. They have been solid millions of years! How fascinating, thanks for sharing this..I love to know that this humming history is there..very grounding somehow, we are all part of where we came..
Hi Cath, yes I think I know what you mean about them being grounding. I love this area of the river for the sense of history it exudes. You are right, Marina. There is always something to learn. Thank you! These are really beautiful. My sister works on fossils formed from cyanobacteria, so I have been learning all about them! 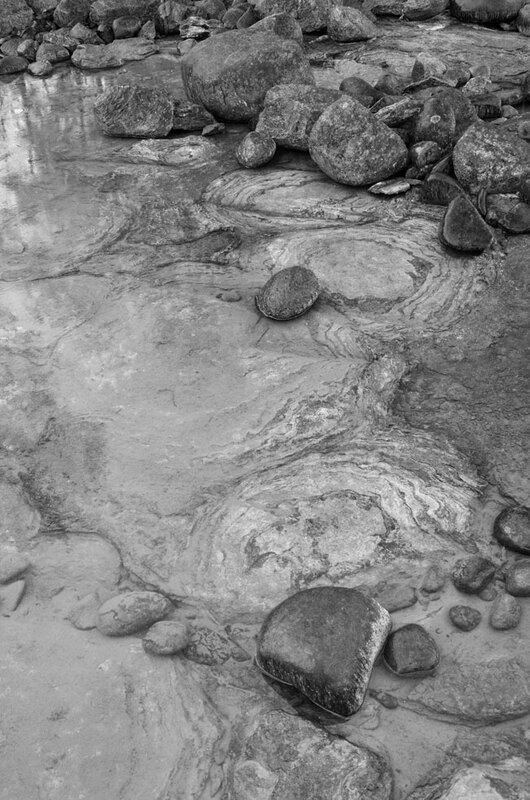 Its amazing what beautiful shapes the goo like microbes can form when preserved in rocks. Hi Anne, that is very cool that your sister studies fossils formed from cyanobacteria! How interesting. Is she working in England? I see you are/were in Vancouver, I’ll have to pop over to your blog. Gorgeous lines, textures and patterns. Very interesting post. Thank you! Nature is just so interesting! I’m glad you enjoyed this Jane, thank you. So beautiful, Karen…the images remind me of a quote you might know…”There is grandeur in this view of life….” Charles Darwin. That is a perfect quote, Scott. Grandeur, certainly. These are wild and cool Karen. I’ve never heard of stromatolites before. Cool !! 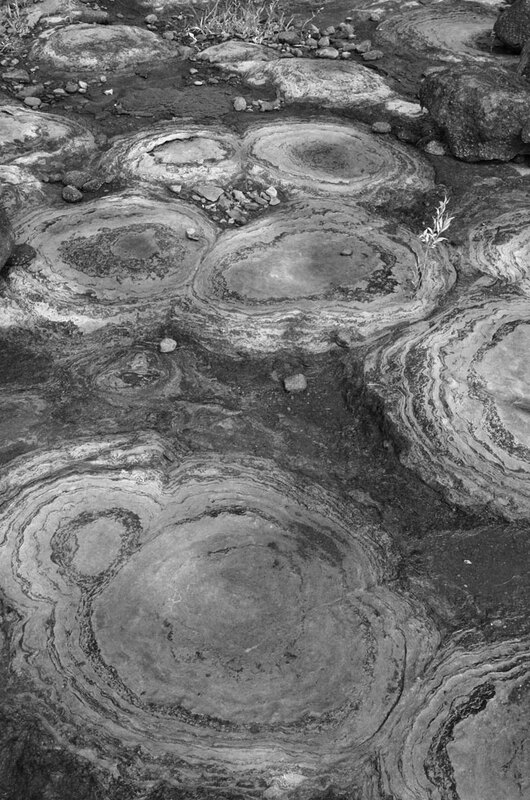 I always thought that stromatolites could only be found in Australia ! Tant de Poésie en l’Univers , s’écoule au Cours du Fil de l’Onde. Nous vous remercions de votre poème! Merci de votre Regard , sur le cours d’une Nature.